Mayor Bill de Blasio declared a public health emergency Tuesday amid a measles outbreak — the worst outbreak in New York City since 1991. Katherine Creag reports. 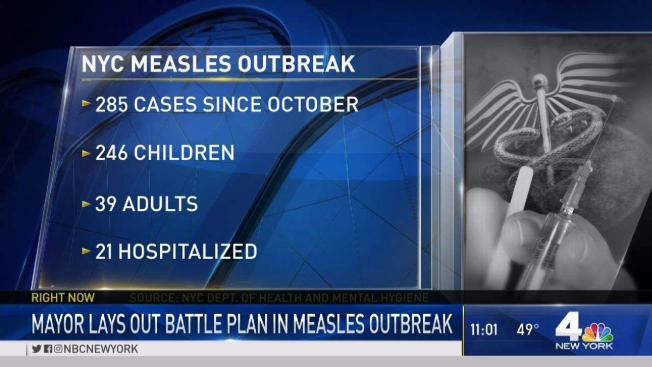 The city took the unusual step amid a surge of 285 measles cases in the city since September, most in one densely packed neighborhood where people now have to get vaccines or risk a $1,000 fine. 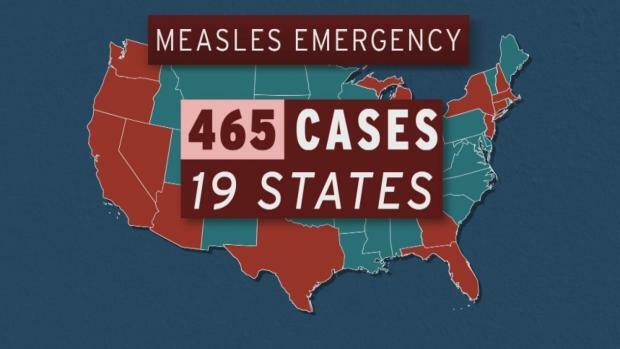 While it's rare in the U.S., about 1 in every 1,000 children who get measles dies, according to the CDC. The virus can live for up to two hours in the air or on nearby surfaces. Nine of 10 unvaccinated people who come into contact with someone with measles will catch it. Dr. Anthony Fauci, infectious disease chief at the National Institutes of Health, recently called it "one of the most contagious viruses known to man." A: Measles is far more common around the world — the World Health Organization said it claimed 110,000 lives in 2017. The WHO says there's been a 30 % increase in measles cases in recent years. Unvaccinated Americans traveling abroad, or foreign visitors here, can easily bring in the virus. For example, a huge outbreak in Madagascar has caused more than 115,000 illnesses and more than 1,200 deaths since September. But you don't need to go as far as Madagascar — common tourist destinations like England, France, Italy and Greece had measles outbreaks last year. Nearly 83,000 people contracted measles in Europe in 2018, the highest number in a decade. Q: Why isn't everyone vaccinated? A: Some people can't be immunized for medical reasons — including infants and people with weak immune systems — and most states allow religious exemptions. But while vaccination against a list of contagious diseases is required to attend school, 17 states allow some type of non-medical exemption for "personal, moral or other beliefs," according to the National Conference of State Legislatures. Q: Why so many cases in New York's Orthodox Jewish communities? A: Most families in Brooklyn's Orthodox enclaves do have their children vaccinated, and most rabbis say there is no religious reason not to get them. But anti-vaccine propaganda has found an audience among a larger than usual percentage of parents in a community used to cultural clashes with city officials. It is also a community whose members travel frequently to other countries where measles is more prevalent.